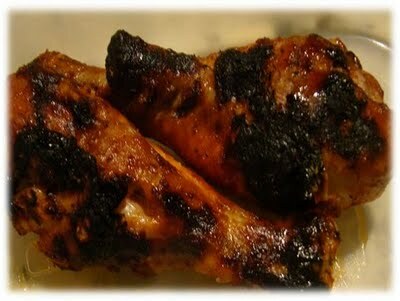 Like chicken thighs, legs are a dark meat that consists of more fat than white meat. Legs look like large drumsticks and have a stronger flavor than its white meat counterpart. They are also the perfect cut of meat to smoke if you are on a time crunch and can’t smoke an entire bird. You will love biting through the crunchy skin to bite into this smoked chicken drumstick recipe that can be smoked in just under 3 hours. Many people love to use a dipping sauce with these delicious smoked drumsticks. Try them with ranch, BBQ sauce, teriyaki, or a buffalo sauce for a little added flavor. Fire up your smoker 30 minutes prior to cooking. This will allow it to come up to a temperature of 220 degrees. Mix all dry rub seasoning ingredients together in a mixing bowl and rub olive oil all over the chicken legs to fully coat the drumsticks. Rub the seasoning mix to fully coat the outside of the legs. Lay your chicken legs on the smoker rack and add smoker wood chips at the same time you add the meat. Apple, pecan, or cherry wood is ideal for this recipe. Smoke your chicken legs for 2 hours and rotate or turn them to ensure even cooking. Add more smoker wood chips periodically as they burn out. Total cooking time is 3 to 4 hours total. This can vary depending on the size of your legs and the temperature fluctuations in your smoker. Make sure to avoid lifting the lid to keep the temperature consistent. Your chicken legs will be done when they reach an internal temperature of 165 degrees.